The word went out one month ago. There would be a special santai (relaxed) ride followed by lunch to celebrate TH’s birthday. Then the route was revealed. 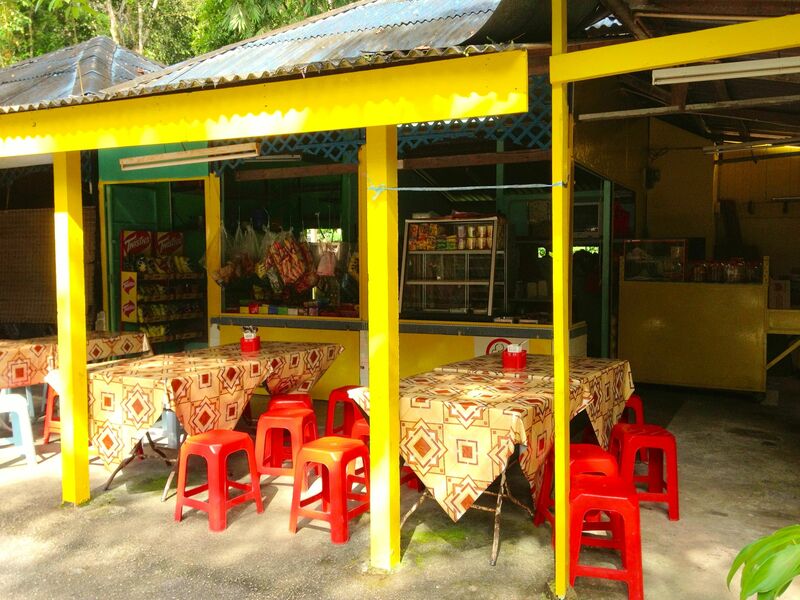 We ride from the Veg Fish Farm Thai Restaurant car park through Batu 14 and over Bukit Hantu to the Sungai Tekala Recreation Forest. We would then retrace our route back over Bukit Hantu and up 3km / 1.9mi of the climb to Lookout Point back to the restaurant. So much for a santai ride. The day before the ride I was asked to map an alternate route for the “less strong” riders who didn’t want to climb Bukit Hantu. There was really only one option. Ride from Batu 14 to Batu 18, and then along Jalan Sungai Lui and Jalan Sungai Lalang to the Jalan Sungai Tekali junction. Then turn around and ride the same route in reverse. The alternate route prompted lots of chatter about where to start the ride. The thought of 140 meters / 460 feet of climbing to get back to the restaurant with Bukit Hantu in our legs didn’t appeal to many. So we decided to park at the Gou Lou Chicken Rice shop on Jalan Sungai Tekali. That turned out to be a good choice not just because it eliminated that final climb. We discovered that the road from the restaurant car park to Jalan Hulu Langat was not only bumpy and heavily patched, it was also steep. 70 meters / 230 feet of elevation over 0.6km / 0.4mi. Twenty-five of us turned up for TH’s birthday ride. A discussion in the Gou Lou Chicken Rice shop car park on the relative merits of each of the proposed routes ended with everyone deciding to do the Bukit Hantu climb. We regrouped at the top of the climb, and again after the descent. And when everyone got to the Sungai Tekala Recreation Forest, we decided to continue on to the Fatt Hwa Gong Temple in Semenyih. Two riders chose to wait at the Sungai Tekala Recreation Forest while the rest of us rode to the temple. “The temple is only 5km from here,” said a few in the group. Yeah right. It was 12km / 7.5mi later that we were on the steps of the temple. The jaunt to the temple added 25km / 15.5mi to our ride. When we got back to the Sungai Tekala Recreation Forest we all decided that we would tackle to climb back over Bukit Hantu rather than ride the flatter but longer route to Batu 18 and then back to Batu 14. It was a challenge going up the steeper side, but everyone got over Bukit Hantu for the second time that morning. It felt warmer than the thermometer temperature of 29°C / 84°F. Cold drinks were required before we drove to the Veg Fish Farm Thai Restaurant. We had some time to burn anyway as lunch wasn’t until 11.00am. The restaurant is built around a large fish pond. The food is delivered from the kitchen to various sections of the restaurant by a small motorboat. And food there was aplenty. Of course there was cake too. Naely and Kevin also have birthdays in June. Thank you TH for inviting us to a fabulous lunch after a tough but enjoyable ride. And an especially big thank you to Alison for the behind-the-scenes organisation. 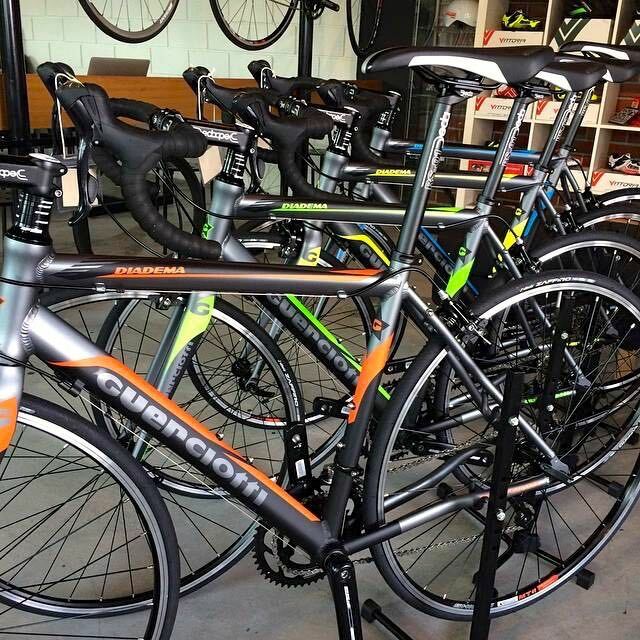 Posted in Cycling in Malaysia and tagged Batu 14, Batu 18, Birthday, Bukit Hantu, Fatt Hwa Gong Temple, Gou Lou Chicken Rice, Semenyih, Sungai Tekala, Veg Fish Farm Thai Restaurant. Bookmark the permalink. No excuse to stay in bed. It wasn’t raining when the alarm went off at 5.30am. 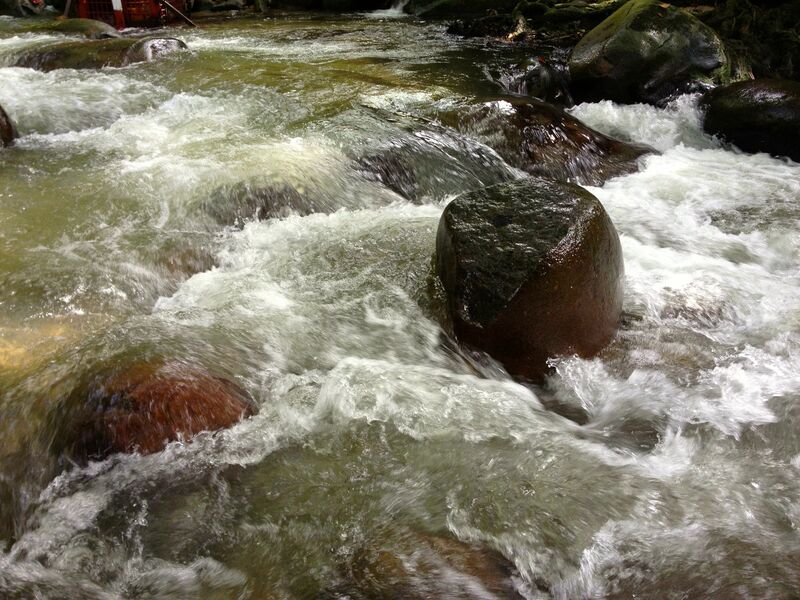 Ninety minutes later I was at Batu 18, Hulu Langat, ready to hit the slopes up to Genting Peras with Chris and Lai. I’ve seen this spot on the border between the states of Selangor and Negri Sembilan referred to as “Perez” and “Peres.” I wasn’t sure of the right name myself, so this time I paid attention to the sign at the summit of the climb. “Peras” it is. Over the crest of the hill is a long descent to Titi. 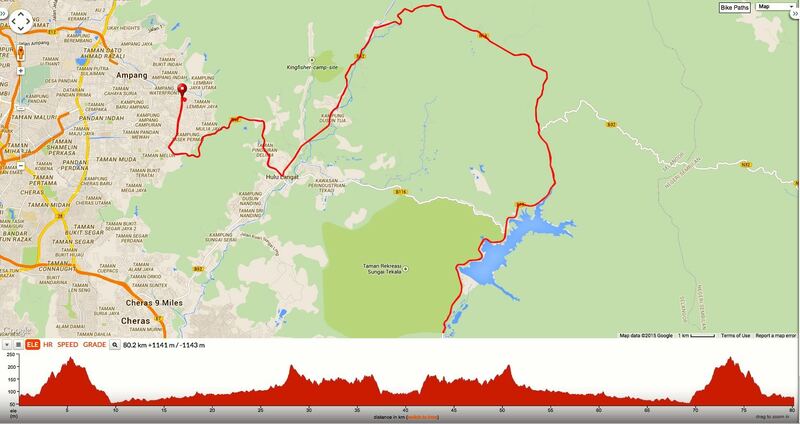 With, of course, an equally long climb to get back to Batu 18. If we had gone to Titi, the last thing I would want to do upon getting back to the top of the hill is to attack. Especially if I were running back up this hill as part of the Titi 100 ultra marathon. Participants in the 200km / 124mi category ran up and down this hill twice! Instead of descending to Titi, we turned around and gravity-surfed back down to Simpang Peras, and then continued on to the Sungai Tekala Recreation Park. The last time I rode past the Semenyih Dam, the water level in the lake was pretty low. All the rain we have had lately has helped raise the water level behind the dam. There is still some way to go before the lake is full, but we may get away without water rationing this year. The lake is a lovely sight when it has water in it. Definitely worth a stop for a photograph or two. The small waterfalls along this route have more volume after all the rain. Another excuse for a breather. If only it wouldn’t rain when we want to ride! 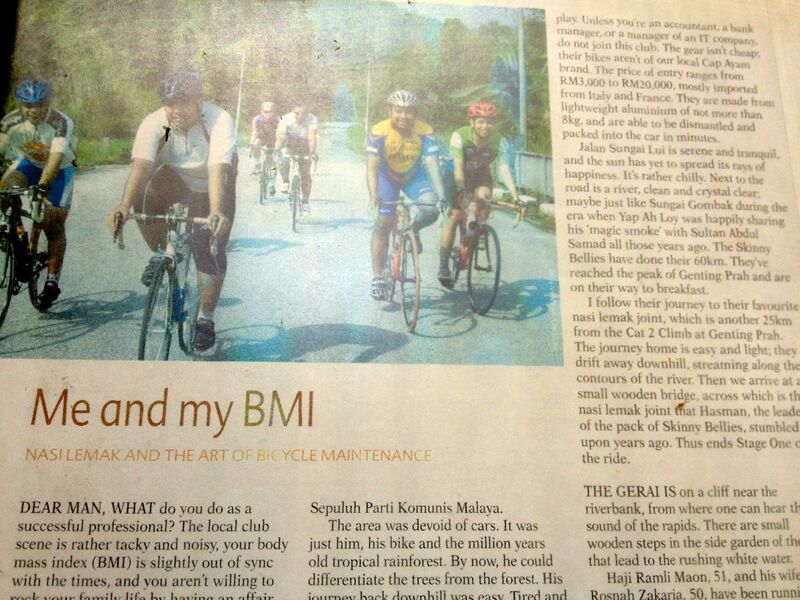 Posted in Cycling in Malaysia and tagged Batu 18, Genting Peras, Hulu Langat, Sungai Tekala. Bookmark the permalink. 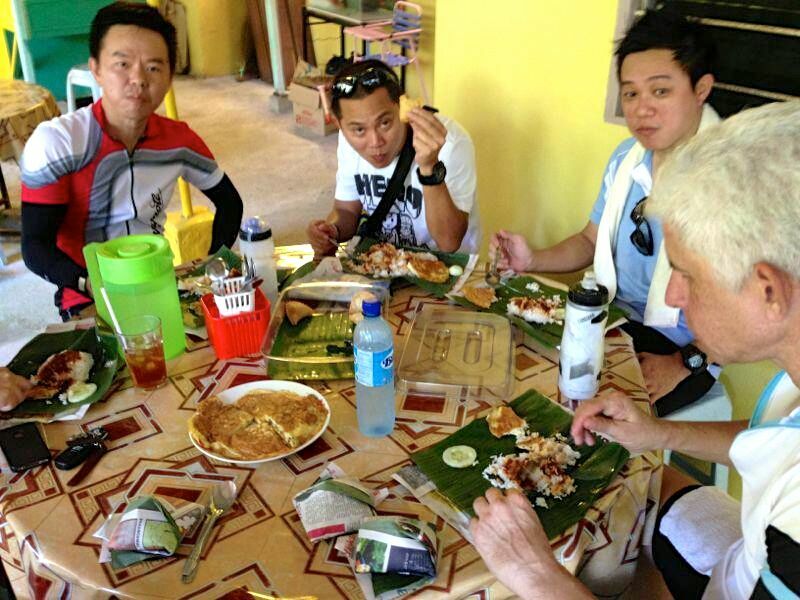 Chon introduced me to an alternative starting point for the ride to the Sungai Tekala Recreational Park. Every other time I have ridden to that park, I have started from the police station at Batu 18, Hulu Langat. This time seven of us met at the Challenger Sports Centre in Taman Dagang Permai. 17 km / 10 mi away from Batu 18. More significantly, there was 150 m / 490 ft of climbing over 3.2 km / 2 mi to overcome almost from the start. There was more climbing between Batu 18 and the recreational park. By the time we made it over the longer 4.2 km / 2.6 mi return climb at 11am we needed a cold drink or two. Fortunately for us the Vélocity Café had opened last October in The Challenger Sports Centre. 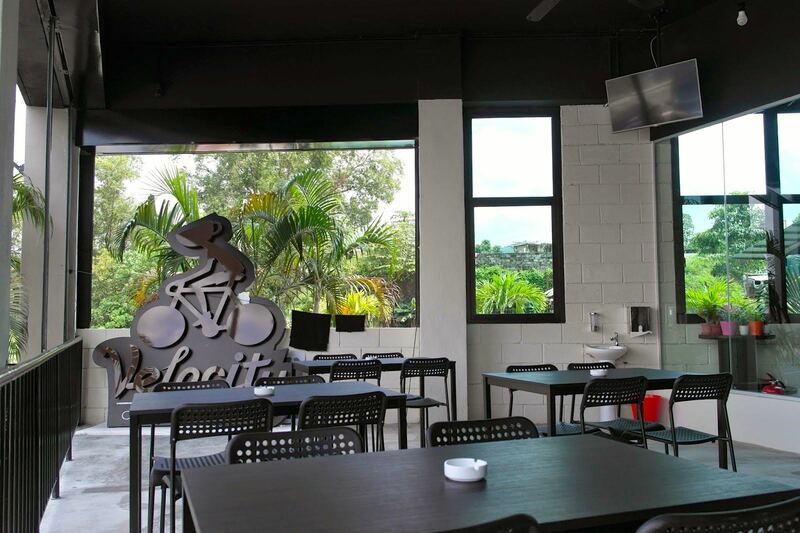 A cycling-themed café catering for the rider who regularly do the Jalan Hulu Langat climb. There is a large outdoor seating area in the front. And a larger air-conditioned room with a variety of seating. 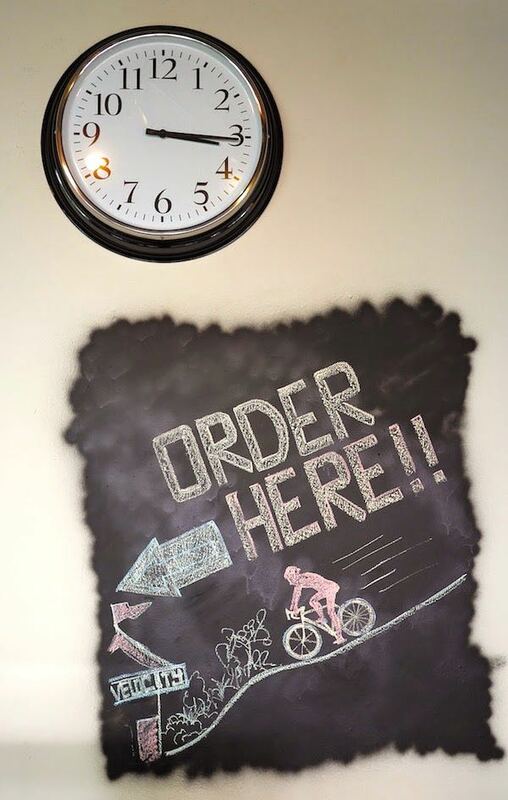 You order from a fairly extensive menu and pay for your order at the counter at the back of the café. I like the tags they use to identify whom ordered what. I ordered a variety of cold drinks: An Iced Latte, a Passion Fusion, and a Banana Milk. All were excellent. We all eyed the food that other patrons had ordered. 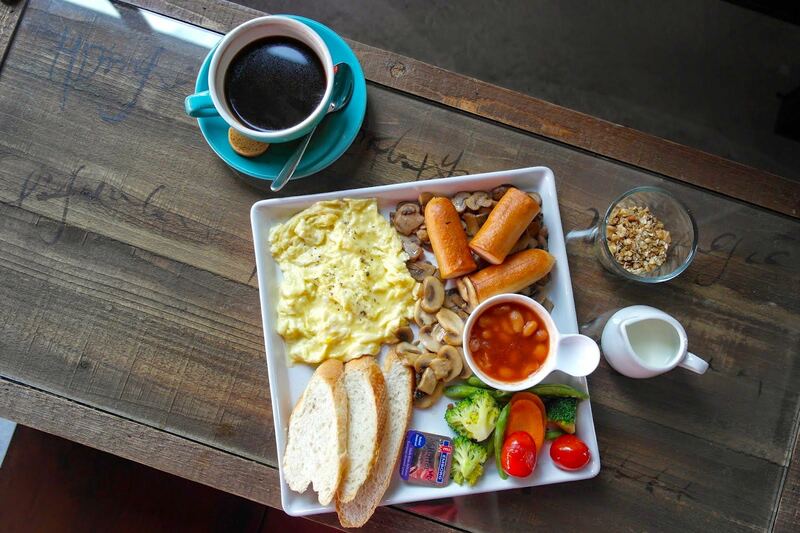 The Big Breakfast in particular looked good. While enjoying your drinks and meal, you can look at the bicycles for sale. The Vélocity Café was very nice, I think we will be back. 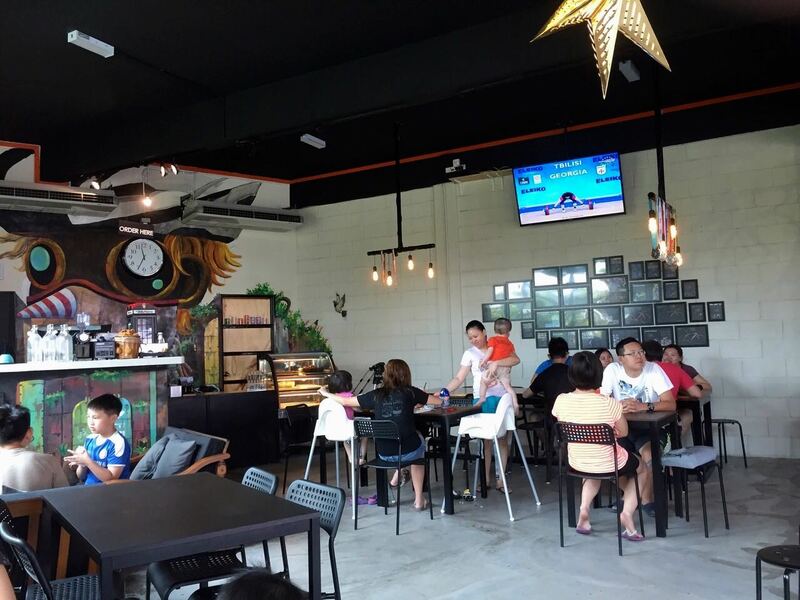 Posted in Cycling in Malaysia and tagged Batu 18, Sungai Tekala, Vélocity Café. Bookmark the permalink. Wind comes with the territory, so to speak, in the Netherlands. So often the key decision for the Not Possibles is whether to start a ride with the wind or against it. Hills come with the territory in Kuala Lumpur. The choice to be made here is to ride a route with some climbing, or to ride a route with a lot of climbing. The choice on recent weekends has been to climb a lot. 1,319 meters / 4,300 feet the Sunday before Christmas. 1,069 meters / 3,500 feet the Saturday before New Year’s. So it was nice to climb ‘only’ 684 meters / 2,240 feet last weekend. 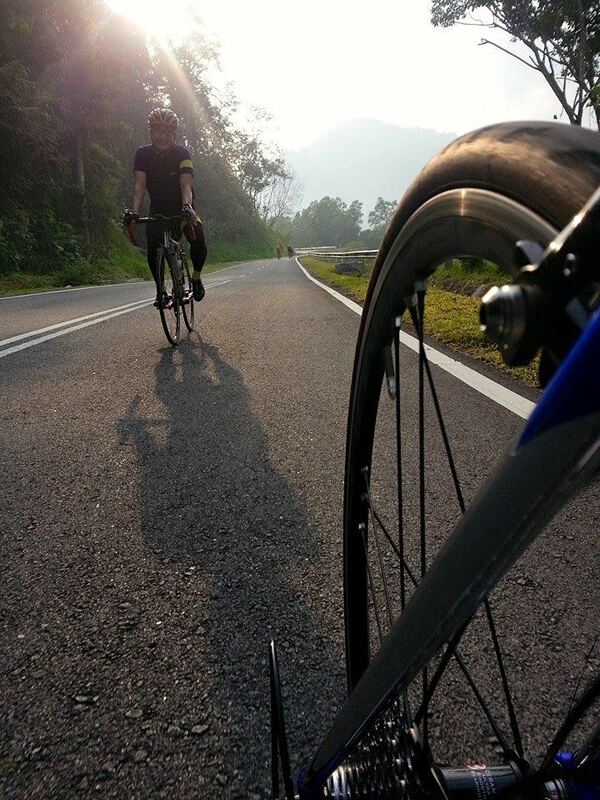 The Racun Cycling Gang met at Pekan Batu 18 at the usual unearthly hour of 6.45am. Well, some of us were there at 6.45am. 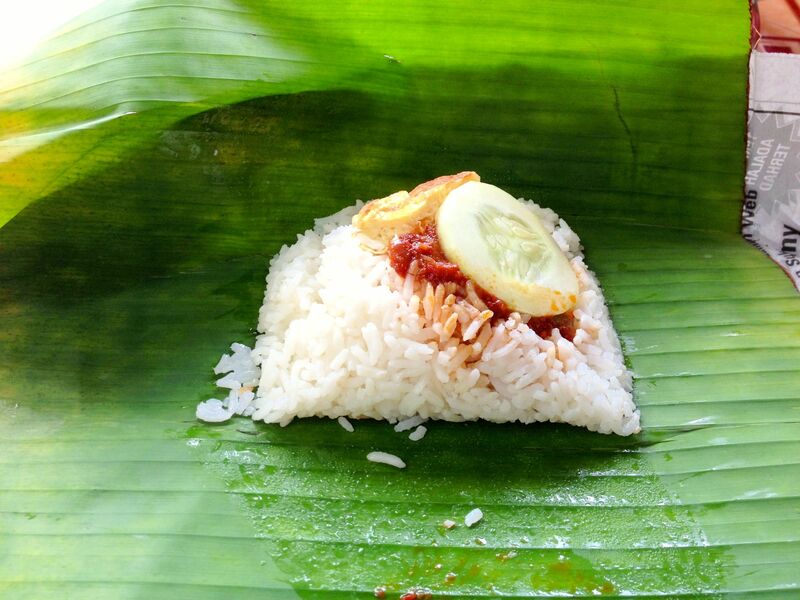 This is Malaysia after all. Our peleton of folding bikes, mountain bikes and road bikes started into the mist along Jalan Sungai Lui at about 7.15am. 11km later we got to the T-junction with Jalan Sungai Lalang and Jalan Hulu Langat – Kuala Klawang. Every other time we have turned right toward Tasik Semenyih. There is some climbing along the way to the Sungai Tekala Recreation Park, but nothing like the climbing awaiting those who turn left. On this day our only option was to turn left. The road to Tasik Semenyih was still closed following a landslide that took a section of the road into the reservoir. Here we are at the T-junction, waiting for the folding bikes to catch up to us. Mark is helpfully pointing out the “Road Closed” sign. We regrouped, girded our loins, and started the 9km climb to the summit of Genting Peres. 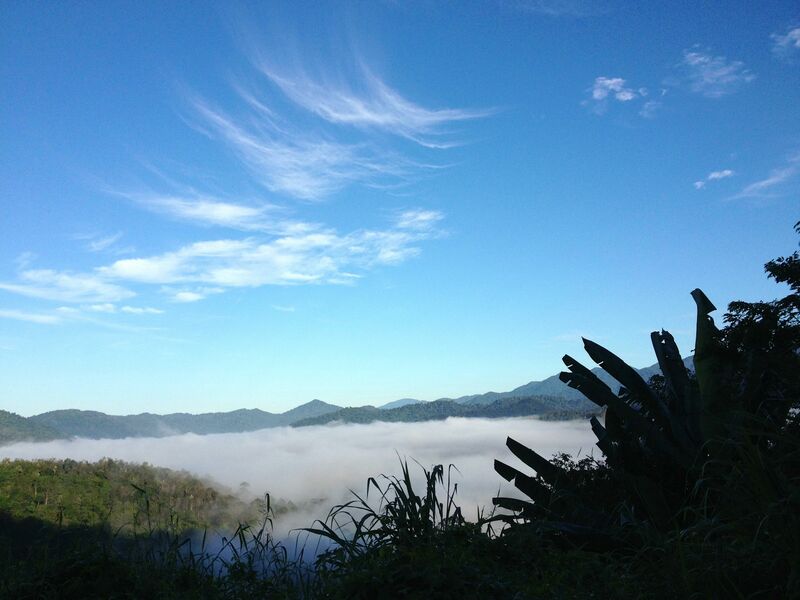 I had struggled to the summit from the opposite direction during the Broga 116 ride in November 2012. This time the climb was almost pleasant. It was much cooler, and I didn’t have cramping quadriceps. A third of the way up the climb we turned a corner to a spectacular view of the mist-shrouded valley below. That view alone made the climb worthwhile. The summit of Genting Peres is on the border between the states of Selangor and Negri Sembilan. We waited at the border marker for the rest of the foldies to arrive. As always the payoff for all the climbing, the view notwithstanding, is the “look ma, no brakes” descent. Well, perhaps not quite “no brakes.” It is a twisty road, the surface is a bit sketchy in one or two spots and there are cars and motorbikes to watch out for. Nevertheless I surprised one driver by overtaking at 60kph. The mist had burned off by the time we got back to the T-juntion. 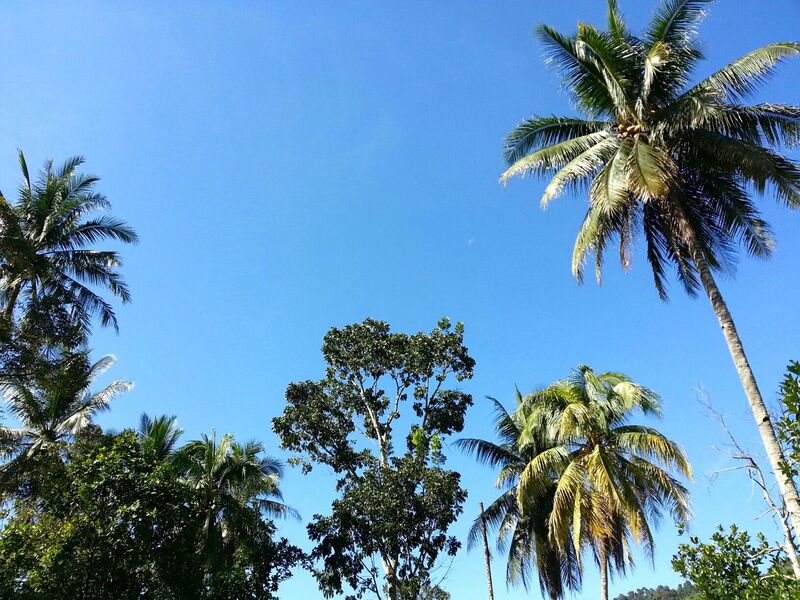 We had blue skies and a crescent moon overhead (I promise the moon is visible in the photo) as we rode back to Pekan Batu 18. From Pekan Batu 18 some of us rode on to the Sungai Congkak Recreational Forest. The others drove there. We all went there for this . . .
Nasi lemak, curry puffs and teh tarik of course. At the stall beside the river. 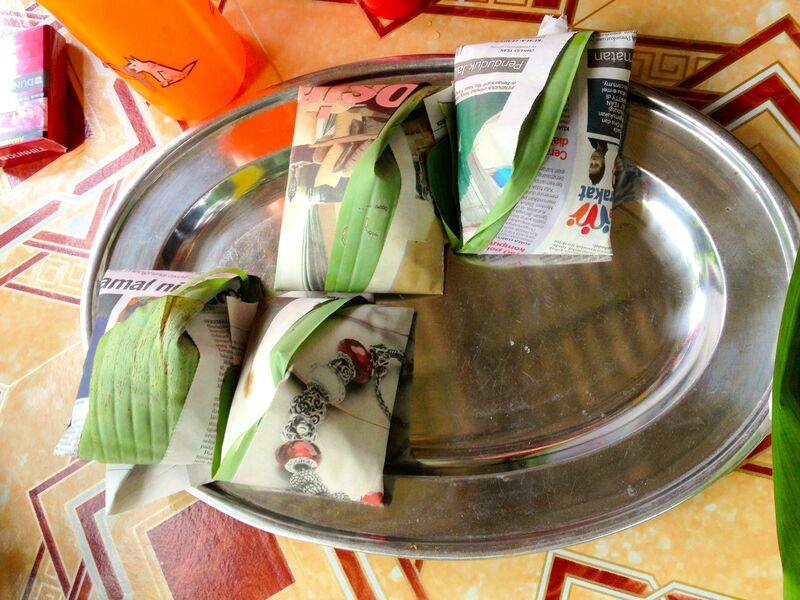 Note that the unopened packets of nasi lemak were not for me! All that was left to do after a beautiful ride and yummy food was to roll back down the hill and gently pedal the short distance back to Pekan Batu 18. And of course to take a nap once I got home. 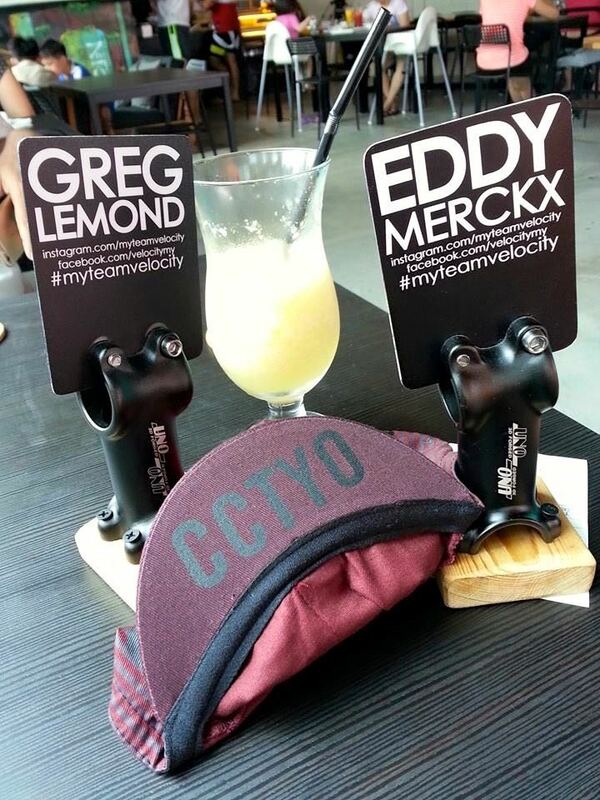 Posted in Cycling in Malaysia and tagged Broga, Genting Peres, Kuala Lumpur, Nasi Lemak, Pekan Batu 18, Racun Cycling Gang, Sungai Tekala, Tasik Semenyih, Teh Tarik. Bookmark the permalink. It has been pouring with rain almost every afternoon and into the evenings for the past two weeks. The Racun Cycling Gang’s evening rides are not the only things that have been washed out. Five times the normal daily rainfall contributed to a landslide that washed out a 200 meter section of road alongside Tasik Semenyih. That puts paid to our weekend rides to the Tekala Recreation area for a while. 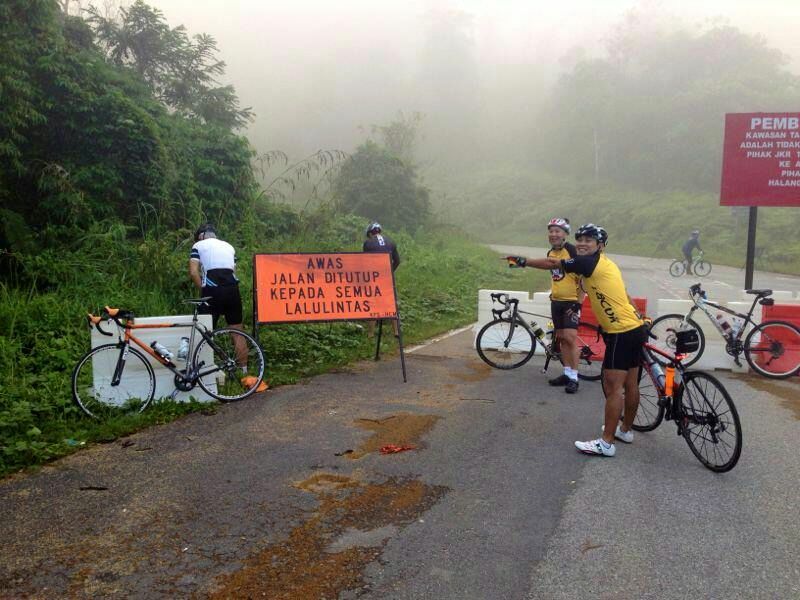 The landslide also caused a change in the route for tomorrow’s Broga Reverse 116 ride. It is now the Broga Reverse 105. Precipitation of a different kind forced the cancellation of today’s Not Possibles morning ride. Enough snow fell on Den Haag yesterday to make the bike paths icy and hazardous. We were lucky last winter. There were many below-freezing days and some snow, but not enough to get in the way of our Saturday rides. Not last winter anyway. This is on the Rottermeren. It was a bit different in the winter of 2010. I took this video from the warmth of our kitchen. You had to be Dutch, or Inuit, to ride on this particular day. Posted in Cycling in Malaysia and tagged Den Haag, Racun Cycling Gang, Rottermeren, Snow, Sungai Tekala, Tasik Semenyih, The Not Possibles. Bookmark the permalink.